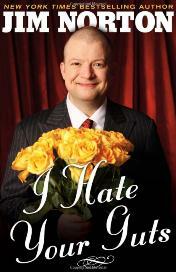 As a follow up to His #4 New York Times Bestseller Happy Endings, Jim Norton’s latest, I Hate Your Guts, takes the caustic comedian/radio host’s comedy to a simpler and deadly accurate level. Norton levels the barrels at various public figures with the kind of invective that would make most people blush. Look out Hillary Clinton, Keith Olbermann, Jesse Jackson and Derek Jeter! If this were a film it would be about two off-ramps past rated R. Each victim gets rended limb from limb with a several-page salvo of crushing analysis/insults. Part of you feels badly for them, but when he’s done, you’re pretty sure they must deserve it. Bad Behavior has blocked 2022 access attempts in the last 7 days.